You dream of giving your loved one a perfect intimate wedding with a small but important number of guests. The guests you invite to the momentous day are important to you. This is why you need the perfect small wedding venue in Melbourne. Red Scooter is able to assist you here as they not only have a dedicated ceremony room for these occasions, but can provide an intimate small venue that still can provide the ambience and style for your reception, on your special day. Small wedding venues in Melbourne can be difficult to find. Red Scooter can provide everything you need. Reduce the stress of organising your special wedding day, by allowing us to provide you with not only the perfect wedding ceremony room, but also the perfect small wedding venue for your reception. Red Scooter’s Ceremony room is the perfect setting for your intimate wedding ceremony, while the Dakota Room is the perfect small wedding venue for your reception, seating up to 100 guests. Aside from this, we provide the perfect cuisine and entertainment for your wedding. Our clients do not just trust us with the venue, but also the food and beverage we provide and standard of service our staff provide your guests. The top quality and variety of entertainment offered will make your reception a night to remember. We are a one stop shop, so you don’t need to worry about any other small details of your wedding, we will take care of it for you. 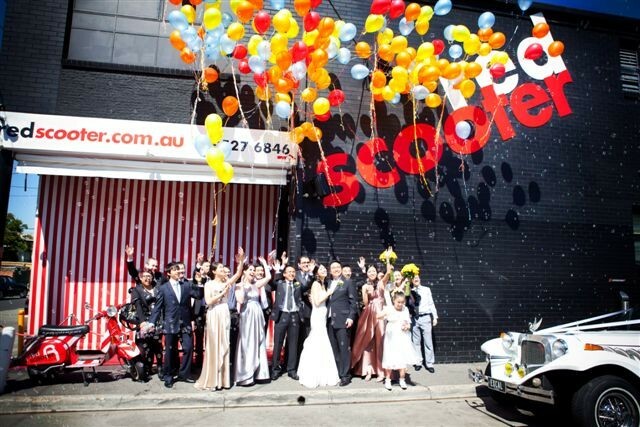 Make your wedding the memorable day that it should be with Red Scooter providing all that you need. Contact us, visit our unique venues and let us help you to make your special day extra special! Here’s how we make your wedding reception a great success.